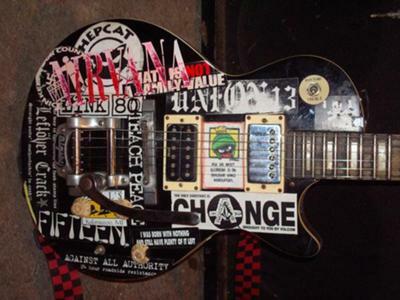 I have a Hondo (les paul style) with a Bigsby tremolo.. the serial # sticker is still on the guitar along with some another sticker with numbers right above it.. My inquiry is there anyone who can help me with either finding a site or someone personally that could lead me to some information about the year and possible value? Does it have Hondo II on the headstock? See this Ebay listing to gauge value and get more information - I think it's the same one, although the trem doesn't look like a classic Bigsby. There was an SG version of the Hondo II with the Bigsby trem that recently sold on Ebay for $300. Hope you can find more information from this. Is it a set neck or bolt on? What's the serial number and is it on a sticker or engraved? Headstock shape? It only says Hondo on the headstock. Not Hondo II is there a difference ? Join in and write your own page! It's easy to do. How? Simply click here to return to Guitar Buying Advice. We hate spam as much as you do. We'll only use your email address to send you great deals.